Garment is a basic need of human being. It's manufacturing process is complicated. 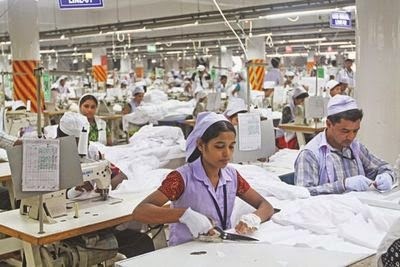 Garment/Apparel manufacturing processing depends on some steps and techniques. It starts from order receiving and will be end to dispatching shipment of the finished garments. A process flow chart helps to understand how raw materials are moved from one process to another process until raw materials are transformed into the desired product (garments). Assimilating of diagram of net dimension on paper each and individual part which is called pattern and when we move with it throughout the whole manufacturing processes. We term it working pattern. After getting all the speech the sample is made and sent to the buyers for approval to rectify the faults. The critical path is identified i.e the problem during the several operations. After rectify the faults, sample is again sent to buyers. If it is ok, than it is called approved sample. Add allowance with net dimension. It is done according to different size. Maker is a thin paper which contains all the components of all sizes of a particular style. Fabric is spreaded in lay form. To cut fabric according to the dimension by special types of cutter. Sorting out the component according to size and for each size make individual bundle. Garments are treated by steam. Also several finishing processes are done for example extra loose thread cutting. Should meet specs given by buyer. After packing the garments are placed in a hard paper box .for export so as to minimize damage. The cartoons contain all the information over the box according to buyer specs. If everything is ok, it is sent to the buyer.